Some users use the same login to access more than one application. This means they are shared between applications. If you change the details of the user in one application (e.g. updating their address), this changes their details on the other applications that they access. This was important for keeping accurate account details and for reducing the need to remember multiple logins. However, if they were removed from one application they would then be removed from all applications they were a user on. This has been fixed (as outlined in the steps below). Previously, if a user was shared between two separate applications (e.g. Sam Andrews is a user on the https://my.smartabase.com/superstars and the https://my.smartabase.com/legends application) if you deleted the user from the https://my.smartabase.com/superstars application they would be removed from the https://my.smartabase.com/legends application. 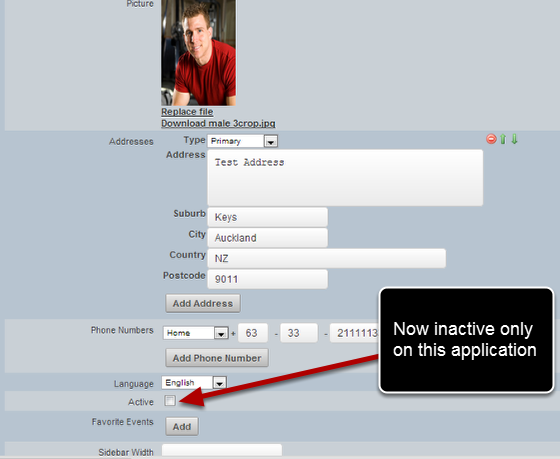 Now they are ONLY removed from the application that you are logged into when they are removed. If a user is shared between two or more applications (e.g. the user shown here is on the https://my.smartabase.com/superstars AND the https://my.smartabase.com/legends applications) if you make the user inactive on the https://my.smartabase.com/superstars application they are also be made inactive on the https://my.smartabase.com/legends application as well. If you need the user to be inactive on one site and still active on the other, you will need to remove the user's Roles so that they cannot login. DO NOT INACTIVATE THEM or they will be inactivated across all sites that are shared on.